twenty seconds ago I heard your little footsteps upstairs. You are definitely not asleep yet. Most likely you have gone to your bookshelf and grabbed yourself something to read. Lately, this has been your M.O. after I press play, close the door and head downstairs. Twenty minutes ago you were in the bathtub splashing around, getting me wet in the process. You love a bath now which has not been the story for most of your life. Since you were born we have bathed you every night and for most of that time you hated it. In the last several weeks this has changed. Usually I start singing our made-up bathtime song. I then ask you to sing it and honestly I can't believe how well you do. Then we head up to your room where we read two books, one that I choose and one that you choose. Even after the second book you look at me and make the sign for more and say moe book to which I reply after your bath. When your bath is almost over, on the nights that Daddy isn't working late, we call to him, Shaune we're ready I say and you repeat Shaune!! much to poor Daddy's chagrin that his baby is still referring to him by first name at times. Daddy comes upstairs and takes you out of the tub as if he is a crane-type robot machine, making machine-like noises, lifting you out by your two hands and bouncing you as if there is a spring in his arms. You usually giggle at this and then he wraps you in the towel and carries you over to our bed and kisses you goodnight. Here I soften your skin with lotion, brush your teeth and hair and put on your pyjamas. You usually ask for your choo-choo (soother) and then we head back to your room for the final book. I then kiss your puppy, then you and press play on the cd player and close the door. Twenty days ago someone asked me how old you were and I had to think. 18 I mean 19 months I said. Time flies doesn't it? she said, this mother of three grown children, enjoy every minute! Twenty weeks ago or so I turned 38 and calculated for the millionth time how old you would be when I turned a certain age. It went something like I'll be almost 60 when he's turning 21. And I wondered how we would be then. I remember that I had watched an episode of Without a Trace where the mother of a missing boy was remembering back to when her now 15 year old was 9. He was faking being sick one morning and she catches him. He confesses that he doesn't want to go to school and asks her if she could stay home from work and they could watch As the World Turns and play Scrabble. She takes off her coat, admonishes him for not being honest in the first place and tells him that she could take the morning off to hang out with him. I loved this scene and felt this yearning to have this moment with you someday. Twenty months ago tomorrow you were placed into my exhausted arms and all I could do was look up at your Dad and then look back at you and say This is our baby? This is you? In all of my prayers, I cannot aptly thank God for the gift of you. I just don't know how to express it in words. I only have tears of joy, moments of sheer grace, and days and days of giddiness. I love you forever and enormously! Thank you to my wonderful friend Jenn at T Rex Mom and Dad Tales for the Thomas the train backpack. We're loving it! This is such a sweet love note to Deaglan! It's so nice to read about your nighttime routine with your little guy. Enjoy all these precious moments. It goes by too quickly! By the way, you should have seen my bath time battles with my boys when they were young. Ugh! What a sweet post. It does go by so very fast. Eat it all up. What a loving sweet post he will enjoy reading one day. So beautifully written. Last night I was at my son's house, and I gave my two year old grandson Ben a bath and read his bedtime story, (never just one, more like three or four). He often reads books to himself in the middle of the night, (the video monitor tells us so.) Ben also calls his dad Mike sometimes. It's so funny to hear him say, "Hey Mike!" 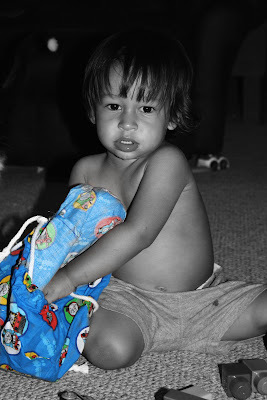 It seems like yesterday that MY SON was two. Time flies, enjoy Deaglan it goes by too fast. loved this letter...sounds like you have a great routine. deaglan is so lucky to have two parents like you! This is truly a very sweet post, Kim. Deaglan will be so lucky to be able to look back on these things you've written to him one day. It does go so quickly. This is such a sweet post to him. When you're almost 60 and he's 21, he will treasure this. This beautiful, sweet and loving note made my morning. You captured perfectly all the joy and love that go into the routines of being with your baby. I remember those days so well and I treasure the memories and photos dearly. The days do go by so very fast. People would tell me that all the time too. However, with each new development phase brings something new and wonderful. A little sadness for the loss of a bit of the baby stage and yet excitement for the new and fun stuff ahead. I LOVED how you wrote this. So much happiness and beauty. You are such a good writer. I hope you print out these posts and keep them in a binder or special book, that you'll always have. Gosh, I did not realize that was the backpack I sent you. I've been thinking about your posting for a couple days and I guess I never made it to the very end. Glad he's enjoying it. I just loved this posting - how you looked back at segments from Deaglan's life and what you experienced and felt during those moments. Just a beautiful posting. Thank you for sharing.